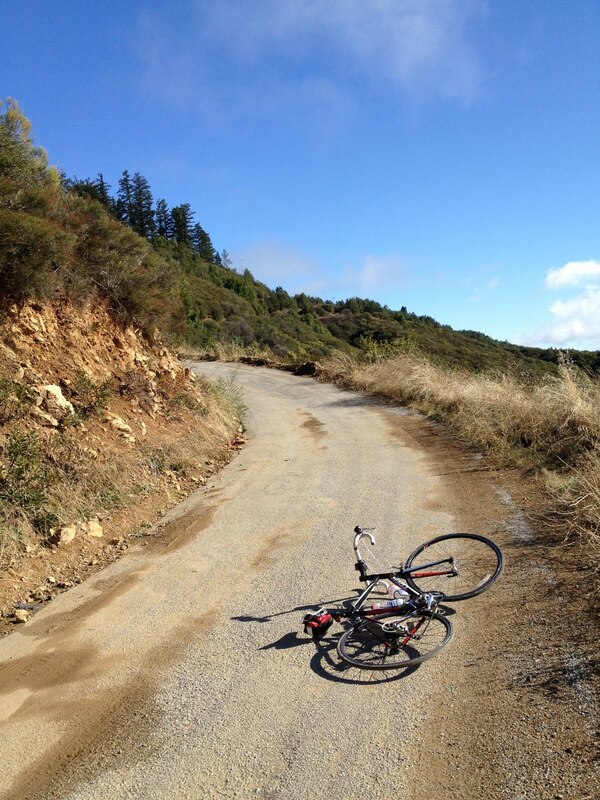 On this Thanksgiving weekend I decided to ride across Loma Prieta, which I haven't done since this spring. It rained a bit on Thanksgiving, but Friday looked clear and relatively warm. I set out at about 9:30 in the morning, this time taking my road bike. The start of the ride followed the usual path down the Los Gatos Creek Trail and up the Leniham dam, then around Lexington Reservoir on Alma Bridge Road. At the bottom of the reservoir I took Old Santa Cruz Highway up to Summit. On Black Friday I suppose the world is divided into people who go shopping, and people who avoid shopping. Neither of them show up on these mountain roads, which were therefore relatively quiet. Actually, there is apparently a third group: those who go out to get Christmas trees. There are lots of Christmas tree farms up here, and it seemed like half the vehicles had a neatly wrapped tree on top. I wonder how they keep them fresh so long? I stopped at the Summit Store for an early lunch. 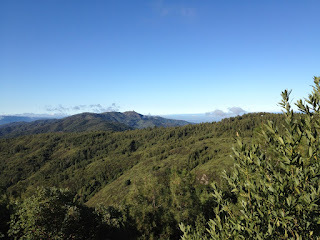 Properly fueled, I backtracked to Loma Prieta Avenue, and headed up the ridge. Immediately on top of the ridge was the last tree farm on this ride, which had the largest crowd I've ever seen up on this road. This part of the road runs straight as an arrow through orchards and vineyards, climbing from 1700 feet to 2400 feet. The average grade is about 7%, but it ratchets up in distinct ramps. At this point in the season the fruit trees and the vines are all losing their leaves, and while yesterday may not have been their peak, they were beautiful nonetheless. There's something luxurious about riding through autumn scenes in bright sunshine. Another small thing to be thankful for, I suppose. Eventually Loma Prieta Avenue begins winding, then suddenly emerges on the southern flank of the ridge with an amazing, expansive, unobstructed view of Monterey Bay. Unfortunately that view was directly into the low sun, and I didn't manage to get a good shot of it. You'll have to take my word for it. At 2400 feet Loma Prieta Avenue turns to dirt. Or on this day, mud. It drops 200 feet to meet up with Loma Prieta Way. Considering the puddles, mud patches and the usual ruts, it was an especially attentive descent. This section along Loma Prieta Avenue, climbing from about 1800 feet to 2400 feet in a little over 1.6 miles, with an average grade of 7.6%. The first ramp up Loma Prieta Way, from 2300 feet to 2500 feet. Just a half mile, but about 9%. 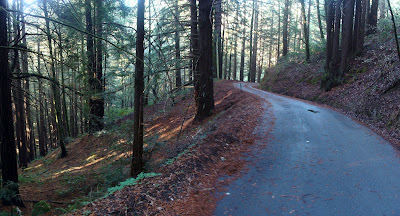 The climb on Loma Prieta Way from 2500 feet to 3000 feet in a little under a mile, with an average grade of 11.2% (Roads to Ride South says that much of this section averages 12.4%). The last push up to the summit area, from 3100 feet to 3300 feet. A little under half a mile at 10.8%. On this ride, I could see the wisdom of this interpretation. The first climb is separated from the second by a 100-foot drop down the muddy path. After the brief second climb, there's a mile that's either flat or slightly downhill. Then after that steep climb to 3000 feet, it's mostly level to the intersection with Summit Road. Looking northeast from the "dirty bump"
The last climb goes up something that used to be called the "dirty bump" before it was paved, but in the pavement has deteriorated to the point that the name might be appropriate again. The recent rain heightened the contrast between the dirt and the dirty pavement, showing just how little of the latter remains. At this point in the ride, I was still deciding whether to head down to Mount Madonna, or to try either Loma Chiquita or Casa Loma. In either case, I wanted to get around the north end of the Loma Prieta peak to get some pictures of the valley on this lovely, clear day. All that ended when a ranger drove by and kicked me off the mountain. Now that's never happened to me before. 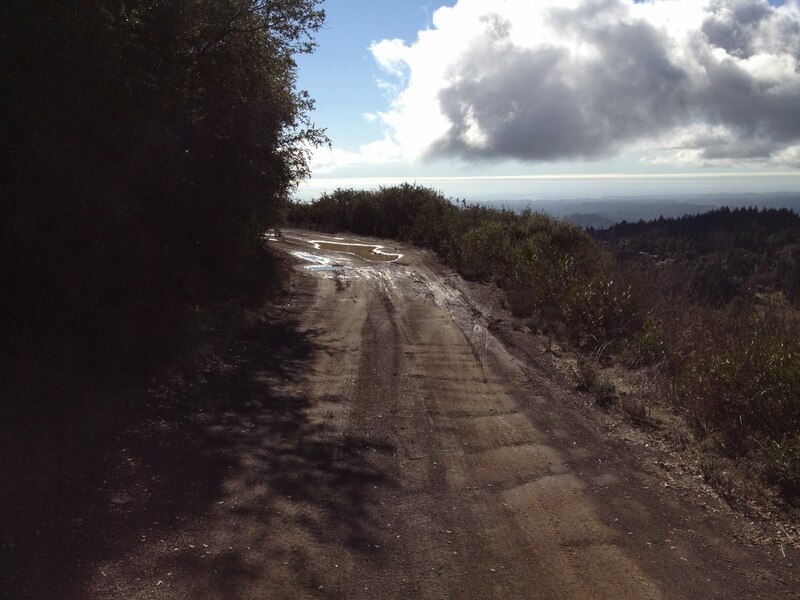 It's just not acceptable that this road -- from the intersection of Loma Prieta Way and Summit, up to (or at least near) the Loma Prieta Peak, and then over to Mount Umunhum -- isn't open to bikers and hikers. I realize that budgets are tight, but this stuff will likely be (officially) off-limits during my entire lifetime. At some point I have to wonder whether MROSD are really on my side, or just their own. Grrr. I dutifully descended through the minefield of potholes, back to the intersection with Summit Road. I headed southeast on Summit toward Mount Madonna. Summit Road is more dirt, and more puddles. Certainly no trouble for my skinny-tire road bike, but it's not exactly relaxing, either. Among the bogus signs that claim Summit is private and closed, one finds a sign that specifically forbids bicycles. It's hard to know how to read that -- the road is private, and even the locals can't ride bikes? Or maybe the no-bikes sign is a backup? In any case, why specifically forbid something that's quiet and incapable of causing harm, as opposed to (for example) motorcycles? 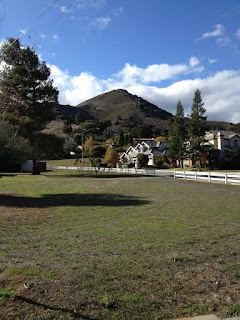 Looking over Morgan Hill, from Summit Road. 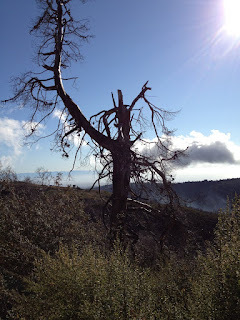 Summit, as the name implies, has nice views all around, but the road itself is pretty ugly. Apart from the various work-in-progress construction sites, the area is still recovering from the fire of a few years ago. Shortly after the road drops to about 2000 feet and exits the supposedly private section, there is a welcome return to pavement. After a thousand feet of descending with careful attention to potholes, puddles, mud patches and all sorts of ruts, it's nice to be able to look around at the sights while you ride. And indeed this section is much more rewarding, with healthy woods surrounding the road. At one point I came across about a dozen wild turkeys, who seemed happy to have survived Thanksgiving. After that it's a quick descent to Mount Madonna County Park. I rode into the park a little looking for water, but I realized that it was getting late and I couldn't dawdle. In fact, the last time I tried this route, I got to this point in the ride and realized I wasn't going to make it. This time it was 3:30 PM, the sun sets at 5, and I was a long way from home. But I felt good and was going to make it. I went down the north side of Mount Madonna Road, which is yet another dirt road. This ride had an unusual amount of dirt riding, but this was the last of it. The road was damp but not as rutted as the others. Still, I was on the brakes the whole time. From there I took Redwood Retreat Road to Watsonville Road, then took that north to Uvas. As I passed the Uvas dam I took stock: 20 miles from home, about 45 minutes of light, no lights on the bike, and I was a good 15 miles from the nearest streetlamp. Oh well, nothing to do but press on, as quickly as possible. As it turns out, I got under streetlamps (at least) with some light remaining, but by the time I got home it was pretty dark. Slight miscalculation, but next time I'll have lights. In all it was just over 69 miles, with 5100 feet of climbing. That's a big ride for me, but I think the reason I'm sore today has more to do with the tempo at the end of the ride than anything else. Well, that and getting kicked off of Loma Prieta. 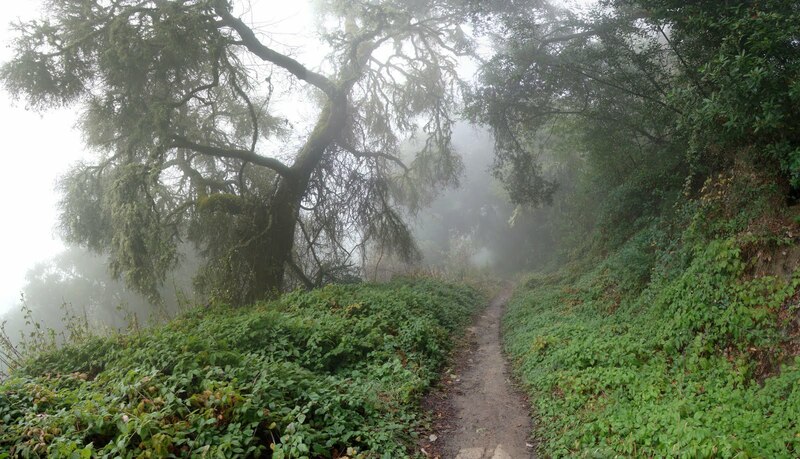 I normally ride my bike in the beautiful Santa Cruz Mountains. This week I looked at a map and realized that I very rarely ride on the other side of Silicon Valley, in the Diablo range. In fact, I think Mount Hamilton is the only ride I've done over there. So yesterday I decided to explore over on that side of the valley a little. The plan was to head up Metcalf Road, a notorious climb, and explore whatever was on the other side of the hill. Looking at the map, I thought there might be a few interesting roads back there, but then looking closer it became clear that at least some of the roads were private and blocked. It's a shame, because I'm sure the hills back there are lovely. I started at about 9 AM under a crystal clear sky punctuated with puffy clouds. Metcalf is roughly west of my house, so I took Santa Teresa Boulevard over to Bernal, and then down Monterey Highway a bit to the intersection with Metcalf. These foothills of the Diablo Range are utterly barren. The contrast with the Santa Cruz range's lush redwoods couldn't be more stark. I don't know whether that's a hangover from old logging or something about the geology, but in any case it doesn't make for much shade. On a hotter day I would have baked on this road. Metcalf Road is not especially long, but it sure is steep. It climbs 1000 feet in about 2.1 miles, for an average of 9%. And worse yet, from the bottom you can see it snake its way all the way up the hill. There's no shoulder on the road, and while it doesn't have a lot of traffic, virtually all of it is trucks with trailers, heading for the motorcycle park at the top of the hill. Those cycles are fantastic. From the road you can see them popping into the air, one after another. Such amazing torque. The other side of Metcalf heads down a bit, through more of the same terrain. It passes by something called the Pratt & Whitney Space Propulsion Test Facility, which sounds intimidating. They pull rockets up these tiny roads? Further down, the road passes by houses and finally enters some thicker woods with much more shade. Metcalf ends at an intersection with San Felipe Road. Heading west, San Felipe drops down into Suburbia, forming the other side of a popular Metcalf loop. I went the other way, heading east on San Felipe into the hills. This is where the maps show lots of spindly little isolated roads, perfect for exploring on a bike. But the more I looked at it, the clearer it became that these roads weren't accessible. Sure enough, after a few hundred yards San Felipe meets Las Animas Road, and enters something called the San Felipe Ranch. End of the road. I continued on Las Animas Road. Again, on the map, this looks like it makes a loop that comes back to Metcalf. I had already seen that the other side of that loop was blocked, and about a mile down Las Animas I came to another gate. This one had signs indicating its the United Technologies Chemical Systems Division. Something tells me these hills are superfund sites in the making. My little exploration of these hills didn't go very far. I sat at the bottom of Las Animas, eating a Clif bar and considering where to go next. If I went down the other side of San Felipe I'd be back in town, with no destination in mind. I decided to head further south, which meant heading back down Metcalf. At the bottom of Metcalf I took Malech Road, which runs right next to Highway 101 for about a mile until it meets Bailey. 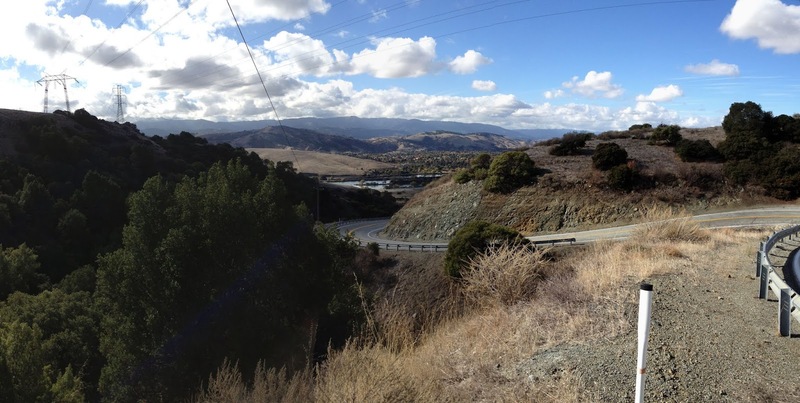 I took that over to the Coyote Trail, and then took that south into Morgan Hill. I don't normally like taking trails, since I think fast bikes can spoil an otherwise relaxed experience for other folks. But virtually no one was on the trail yesterday, which made for a quiet and pleasant run next to the creek. At the end of the trail I took Cochrane, heading southeast. At one point there's a sign for Anderson Dam, so I took a look. After a remarkably steep little hill, I got a good view of the valley, on one side, and the reservoir on the other. 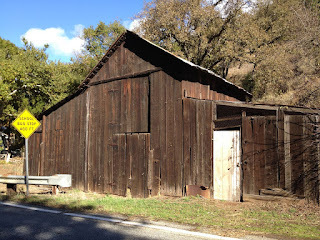 It was about time to think about heading home, so as a start I headed across the valley on Main Avenue, into the charming little downtown area in Morgan Hill, and then down Dunne, De Witt and Edmunson, all heading around El Toro. I took Oak Glen around the Chesbro Reservoir, where a couple of turkey vultures patiently waited for me to pass before they dug into some roadkill. I continued to Uvas, then headed north toward home on McKean and Camden. In all it was just over 62 miles, including a couple of unnecessary turns near the end to ensure I covered at least 100 km (a small accomplishment, but an accomplishment anyway). 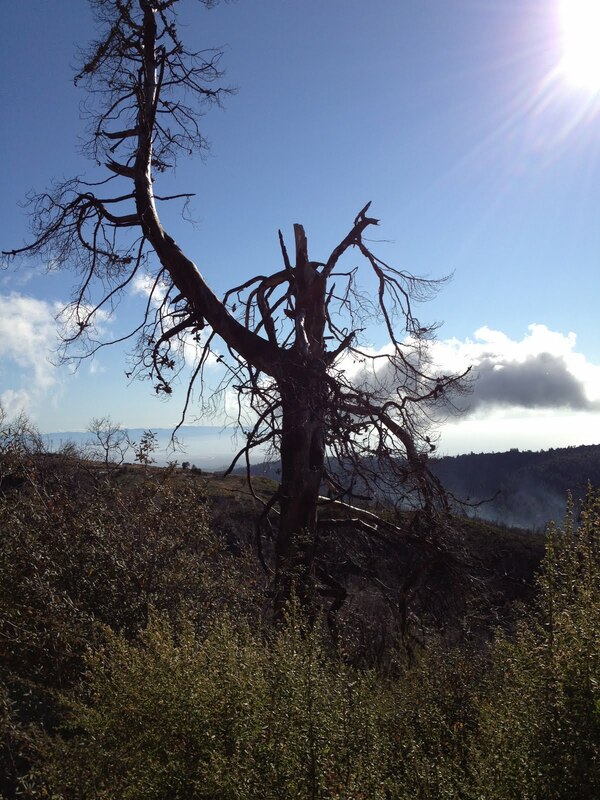 It was just 2700 feet of climbing, although it seemed like more. Wandering around the hills on roads completely unknown to me was great, and it's a shame there aren't more miles to ride over there. It looks like Coyote Lake, a little farther south, might have more miles in hills, but that's stretching my range quite a bit. Maybe next time. As much as I prefer starting and ending bike rides at my house, there are only so many roads to explore within my range. If I want to see new sights, I've got to pack up the bike, at least occasionally. With that in mind, yesterday I put the road bike on the back of my car and drove up the peninsula to start my ride near Palo Alto. It rained Friday night, but that's OK -- it just means that dirt roads were out. So where did I go? To a dirt road, naturally. I've often read of Alpine Road, and have been itching to see what it's like. But the top couple of miles is all dirt. The unofficial Stanford cycling page says that the dirt portion is fine for road bikes, apart from one bypass section and shortly after rains. We'll see. I got off 280 and parked just off Alpine Road. Despite the drive, I managed to get rolling on the bike shortly before 9, which is pretty good for me. It was very foggy but not particularly cold. Alpine Road starts off as a busy two-lane road climbing imperceptibly. After Portola Road the traffic is much lighter and the road shrinks until it's just a one lane road, climbing a little more steeply. The road follows a creek much of the way, winding through full, lush woods. Shortly after the intersection with Joaquin Road, at perhaps 1200 feet of elevation and thus about 800 feet remaining, the asphalt ends and the dirt begins. I was expecting that it would continue as an unpaved road, perhaps a fire road, but instead it immediately became a single-track trail. Riding up the day after rain was not wise. There were a few puddles and mud patches, but the real problem was the wet leaves. I was spinning my back wheel trying to climb, and the whole bike was squirrelly when the mud allowed the wheels to slide left and right. At one point I stopped to take some pictures, and decided enough was enough -- I would turn around. And yet, heading back down seemed worse, for all of the same reasons. So I continued up a bit, and pretty quickly got used to the conditions and started enjoying the scenery. Midway through there are signs -- permanent signs -- telling you that the trail is washed out and impassable, and that you should use the bypass. How long does the bypass have to exist before it gets accepted as the new route? The whole bypass section is steep and no place for a road bike. I had to walk all the way through it. The rest of the trail was a very enjoyable ride. I emerged onto Page Mill Road quite muddy but otherwise in good shape, and rode up to Skyline and across to the west side of Alpine Road. The west side of Alpine climbs a bit more, up to 2400 feet, the high point of this ride. The descent of Alpine Road was pretty, cold and uneventful. 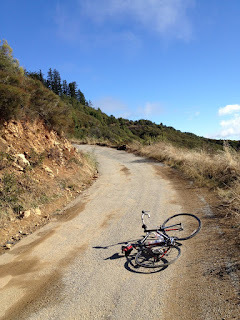 Eventually I reached an intersection with Pescadero Road, and made a tactical error. The choice here is to go down the road to La Honda and then to San Gregorio, or to take Pescadero Creek Road to Pescadero. I was going to do the loop either way, so it was basically a choice between counter-clockwise and clockwise. 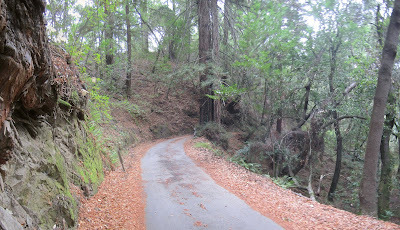 I chose clockwise by heading up Pescadero Creek Road, which immediately takes you over Haskins Hill. 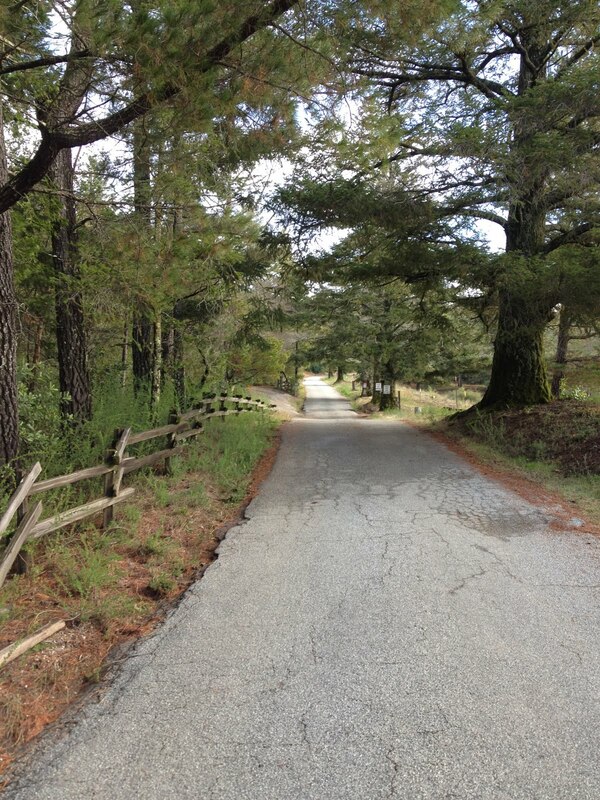 Pescadero Creek Road takes you down through the teeming metropolis that is Pescadero. As I approached the town the valley spread out and the wind began to blow. I take it that the prevailing winds here blow from the north, which is why my route was a bit of a tactical error -- it would have been a little easier to head to San Gregorio first, then go south to Pescadero, rather than the other way around. Live and learn. The road goes past a large marsh before rising to a beautiful view of the Pacific. I enjoyed the sea breeze for a few minutes, then headed north, up into the wind toward San Gregorio. The views along Route 1 are always spectacular, and took one's mind off the wind. At San Gregorio I stopped at the store for a sandwich and a drink. I must admit that I first became aware of this store when it appeared in a commercial than ran during the Tour de France. In the commercial, two riders show up at the store -- one pudgy, the other buff. The buff rider reviews his data from his iBike Dash iPhone application with a self-satisfied smirk. Meanwhile the pudgy rider struggles with his traditional computer, and by implication his manhood, before scurrying into the store after the buff guy. It's an awful commercial on every level, but when I first saw it I thought that San Gregorio sounded like a California kind of name, and lo and behold it's right there on the fringes of my range. So in some way that commercial may have inspired this ride. I finished my sandwich and headed inland, past cows and farms and rustic barns. The road climbs a few hundred feet in the seven miles to La Honda, after which it tips up a bit on its way toward Skyline. 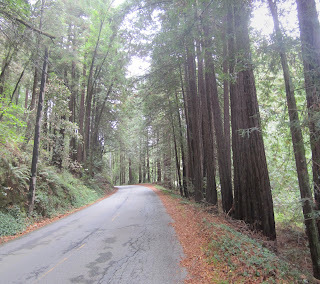 After a few miles I peeled off onto the west side of Old La Honda Road, which like its counterpart on the other side of the hill is a very pretty single-lane road. It serves a few houses, but is largely a bicycle road. Up to this point, the whole ride was on roads new to me. 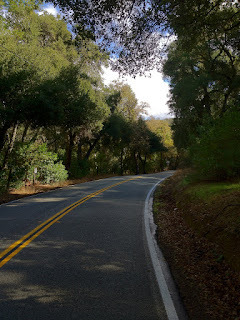 When I got to the top of the hill I was thinking about descending Highway 84, which would also be new, but instead I headed down the east side of Old La Honda Road. It turns out that I had forgotten my helmet (a consequence of driving to the start, rather than leaving from my house), and I was thinking that I'd be tempted to descend 84 more quickly than I should. At the bottom of a long, busy descent, I took Portola Road back to Alpine and my car. Elevation profile for this ride. See a note about data for details. In the end it was just under 60 miles, with about 4800 feet of climbing. It's amazing to me that I can ride through suburbs, redwood forests, barren hills, marshes, farms and oceanfront cliffs, all in 60 miles. In Silicon Valley the dry season is over and the rainy season has begun. After six months in which it rained perhaps once, the forecast now shows rain about half the time (and centered on weekends, once again). It rained Friday and it was supposed to rain Sunday, but since Saturday morning looked pretty good I decided to squeeze a ride in. If it didn't work out, I could try again the next day. The plan was to ride Mountain Charlie Road again, this time toddling through the hills rather than going down through Santa Cruz. When I woke up this morning my temperature gadget read 43° F, which is a few degrees below what reliable sources were reporting, but either way it's awfully cold. I dawdled for a while (and watched the temperature drop to 42°, ominously), and put on lots of clothes. Just last week I bought a new cycling jacket with removable sleeves, so this looked like a good day to try it out. I finally got on the road a little after 10 AM. I started with the usual route down the Los Gatos Creek Trail and around the Lexington Reservoir. On the way up Old Santa Cruz Highway I tried something new, for me. Last week, my riding partner stressed the importance of keeping your heart rate in a reasonable range, whereas my standard technique is just to push as hard as I can manage at any given moment. So for the first time, I made the heart rate show up nice and big on my Garmin, and moderated my effort to keep my heart below a certain number. Old Santa Cruz Highway is a good place to try this sort of thing, since it's not very steep and doesn't even have any steep ramps. I was quite pleased with the result, I must say. I've been riding for decades, and even riding with a heart monitor for more than a year, but this is the first time I've really used it on the ride. I felt great on the whole ride, didn't feel at all tired near the top, and all-in-all I probably didn't even go too much slower. Since I rarely dug into my reserves, I wasn't trying to both recover and climb on the hills. At this point I don't think I could moderate my pace like this without seeing the heart rate on the device. I always try to pace myself, but my natural reaction to a steep section is to try harder, rather than slow down. It's easy with the feedback at hand, though. I'm wary of becoming overly analytical in my riding, since I'm out there to enjoy myself, not to meet goals or even improve. And as an engineer, it would be easy for me to fall into that trap. But I do want to undertake longer rides through the mountains, so if this will help, I'll try it. 7-up your thirst away! Buy gro! I stopped at the Summit Store for a lovely sandwich and some coffee to warm me up, then dropped down the Soquel/San Jose road. 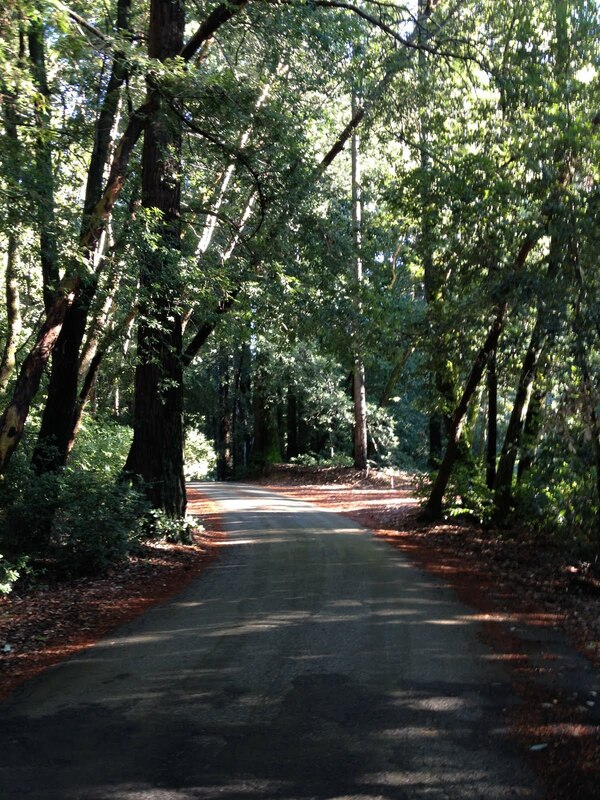 I normally take this right down into Capitola, but this time I turned up Laurel Glen Road. Somehow Laurel Glen seemed to have more traffic than Soquel/San Jose had, and the broken asphalt makes it difficult to stay in the right-hand margin. But the traffic quickly died away, which made the road quality a non-issue, and I was left largely alone to ride a bike on a beautiful, isolated road through towering woods. I'm awfully lucky. Laurel Glen climbs a bit, and I continued my heart rate experiment. This time the road had a few steeper pitches, but I was able to stay in my range (and I thought I was slow before!). At its peak, Laurel Glen turns into Mountain View road, which drops down to an intersection with Branciforte Drive. I took a left and continued down the road, which in this area is rural and quite charming. At Granite Creek Road I took a right, and headed up the road toward Scotts Valley. As you can see from the profile below, there were a few steep ramps, but once again I did a reasonable job keeping my heart rate below my target, mostly by riding slowly. Anyone seeing me would think I was practicing track stands. As Granite Creek Road reaches its peak it emerges from rural isolation to thoroughly suburban Scotts Valley. It crosses Highway 17 and meets Scotts Valley Drive right at the intersection with Glenwood Drive. After topping off my bottles at the gas station, I headed up Glenwood. There's a train tunnel entrance near the intersection of Glenwood and Mountain Charlie Road, and last time I came through here I missed it. So when I got to Mountain Charlie Road and once again hadn't seen it, I backtracked down Glenwood, still couldn't find it, and looked further down Glenwood, past the intersection. No dice, again. I'm going to have to do more studying before I come up this way again. Mountain Charlie Road was thick with fallen pine needles of a bright orange color that doesn't seem realistic, even as you see it before your eyes. The lower part of this road has just a single rough lane, and appears to rarely see cars. It climbs steadily but not steeply through thick, silent woods. At about 1300 feet you start running by houses, and gradually the road acquires another half lane and shows signs of more frequent use. Apparently the locals skew north, toward Summit. At about this point I started to see a drizzle, which quickly built up to a full-on rain. My new jacket seemed to be reasonably waterproof, and the whole ensemble was warm enough. The upper part of Mountain Charlie Road has lots of steep ramps, each of which threatened my heart rate limit, and most of which broke it. I tried various random things to keep it in check, like breathing heavily at the beginning of climbs and other nonsense, all of which I'm sure had little effect. Nonetheless, apart from one notable ramp, I was pretty close, even on the long sections. I got to the top of the hill, the intersection with Summit and also the high point of this ride, feeling a little cold but otherwise great. I was thinking about riding up Summit to get more time on these single-lane roads that I enjoy so much, but I happened to notice that it was nearing 4 PM. I suppose that's the downside of the heart management technique. So instead of lengthening the ride I headed directly home, taking the remainder of Mountain Charlie Road to Old Santa Cruz Highway, and that down to Highway 17 and Los Gatos. With a little left in the tank, I took Shannon over the hill. In the end it was just slightly over 60 miles, with 4200 feet of climbing. By monitoring my heart, I never really suffered, never had to recover, and felt great after the ride. It was slow, but... maybe not. The previous ride up Mountain Charlie Road was shorter and had less climbing, yet on this ride I had a (slightly) faster moving average. Of course that ride was hot and this was nice and cool, but in any case it shows that the overall speed isn't affected much, regardless of how pokey it feels on the bike. Learn something new every day, I guess.